The DrugControl ETG Test is a rapid chromatographic immunoassay for the detection of Ethyl-β-D-Glucuronide in human urine at the cut-off concentration of 500 ng/mL. The following table lists compounds that are positively detected in urine by the DrugControl ETG Test at 5 minutes. Ethyl Glucuronide (ETG) is a metabolite of ethyl alcohol which is formed in the body by glucuronidation following exposure to ethanol, such as by drinking alcoholic beverages. It is used as a biomarker to test for ethanol use and to monitor alcohol abstinence in situations where drinking is prohibited, such as in the military, in professional monitoring programs (health professionals, attorneys, airline pilots in recovery from addictions), in schools, in liver transplant clinics, or in recovering alcoholic patients. ETG can be measured in urine up to approximately 80 hours after ethanol is ingested. ETG is a more accurate indicator of the recent exposure to alcohol than measuring for the presence of ethanol itself. 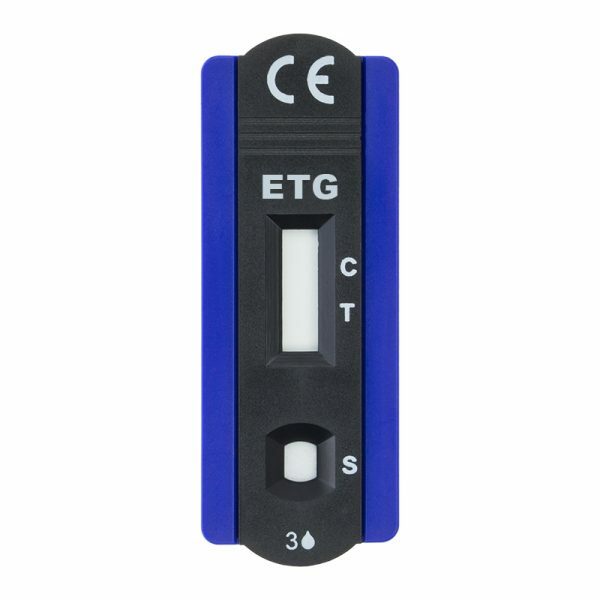 The DrugControl ETG Test is an immunoassay based on the principle of competitive binding. Drugs that may be present in the urine specimen compete against the drug conjugate for binding sites on the antibody. During testing, a urine specimen migrates upward by capillary action. Ethyl-β-D-Glucuronide, if present in the urine specimen below the cut-off level, will not saturate the binding sites of the antibody in the test. The antibody coated particles will then be captured by immobilized Ethyl-β-D- Glucuronide-protein conjugate and a visible colored line will show up in the test line region. The colored line will not form in the test line region if the Ethyl-β-D-Glucuronide level exceeds the cut-off level because it will saturate all the binding sites of anti- Ethyl-β-D-Glucuronide antibodies. A drug-positive urine specimen will not generate a colored line in the test line region because of drug competition, while a drug-negative urine specimen or a specimen containing a drug concentration less than the cut-off will generate a line in the test line region. To serve as a procedural control, a colored line will always appear at the control line region indicating that proper volume of specimen has been added and membrane wicking has occurred.